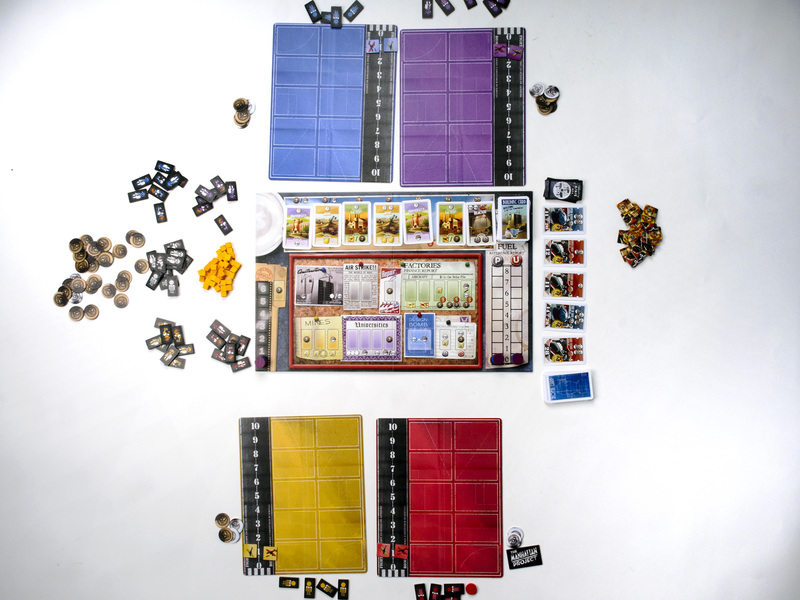 By Loyd Case on June 23, 2014 at 2:01 a.m.
Worker placement games seem to be about allocating your scarce workers to collect resources to score points. But if that’s what you’re doing, you’re doing it wrong. Today, we cover a few of my favorite games based on the managing of workers--the engines of victory. I don’t like Caylus. There, I’ve said it, and got it out of my system. What, you in the back of the room--I heard you gasp in astonishment. You think I should turn in my board game player credentials, maybe cancel my account at Board Game Geek? I’m not saying Caylus is a bad game. It’s a brilliant design--the prototypical, seminal worker placement game. Sure, before Caylus, there were games in which you would put little pawns on the board so you could take some action. But Caylus is the game that turned worker placement into a genre, and spawned a legion of games using the mechanic. Photo credit: Flickr user courtarro via Creative Commons. What’s important about Caylus isn’t the ability to place a "meeple" on the board and take an action. Caylus is all about building your victory point engine. 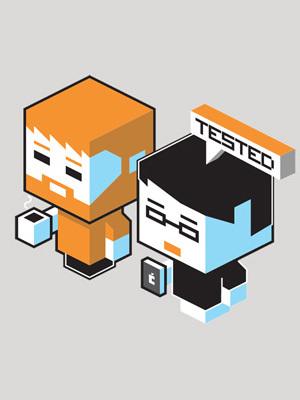 Each action you take builds on the previous one, giving you new ways of collecting more resources and cranking out VPs. Caylus is also about tough choices. You essentially get one action per phase to place a worker. The choices are limited, especially if you’re not first in the turn order. Every action has a consequence, and you always need to keep the goal in mind of building the castle. 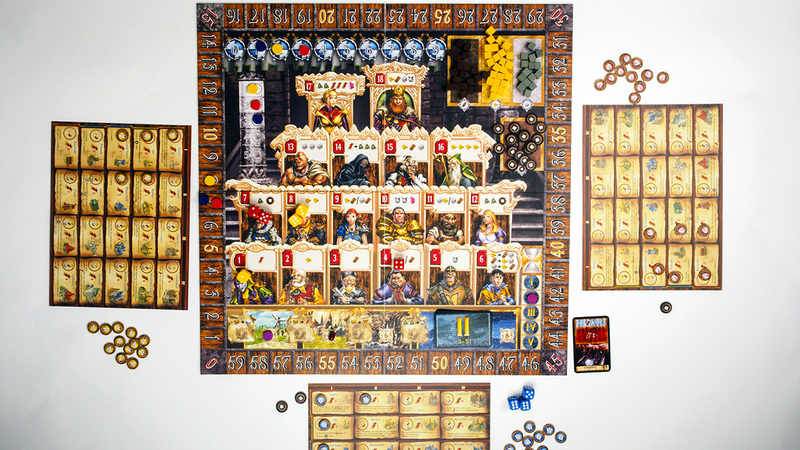 I don’t like Caylus mostly because I’m wired to like games with strong themes, and the theme of building a castle feels tacked on. 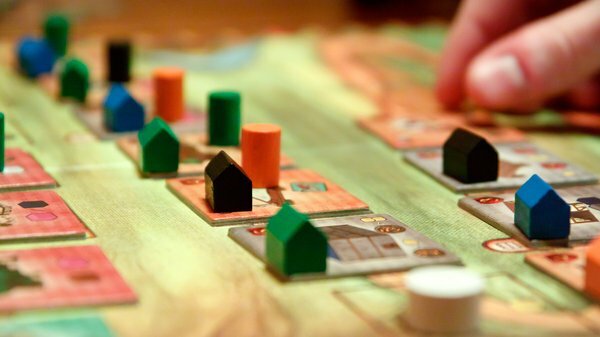 Worker placement games are, as I noted, about building the victory point engine, and Caylus feels a lot like that’s all it is: a ruthlessly efficient engine for generating victory points. Nevertheless, it was a brilliant design when it first appeared, and is one of those games all board gamers should at least play once or twice. An electronic version of Caylus is available for both iOS and Android, if you want to see how it plays, if you don’t require the full tabletop experience. Limited actions and choices per player turn or phase. Often, this is just one action, usually placing or removing a worker. Sometimes you may take multiple actions, but doing so has a cost. You may not be able to place a worker where you want, because someone else is already there. Building layers of complexity. Initial choices are simple, giving you the resources you need to acquire increasingly complex capabilities in subsequent rounds. Basic resources lead to derivative resources, which in turn lets you build structures to generate more resources or victory conditions. Create feedback loops or resource cascades. The capabilities you acquire, be they buildings, better workers or technologies researched can often create feedback loops which allow you to acquire resources at a faster clip. Discrete turning points. Sometimes these are specific phases called out in the game, as players achieve certain conditions. More often, these are strategic turning points – you, the player, need to gauge when to shift from gathering resources and capabilities to hitting those victory conditions that will win the game. The timing to make the shift is often the difference between winning and losing. A good worker placement game has you skating on the thin edge of disaster, as you feed resources into your engine to hit victory conditions or gain points. Too soon, and you fall short and have to regroup. Too late, and another player gets to the goal first. Now let’s look at some worker placement games I have in my collection that come out to the table frequently. These are in no particular order. I’ve been complaining about the thin or unappealing themes in many worker placement games. Kingsburg is no exception. It’s bog-standard fantasy theme (you only realize its fantasy during the end of year combat phase) and the medieval trope of building your city seem layered on rather thinly. What’s fun about Kingsburg is the strict dice placement. Your workers are dice; you start the game with three dice, and can acquire a fourth, either permanently or temporarily. You get resources and capabilities from advisors, numbered 1 through 18. You can only place you workers if the rolled value exactly equals the advisor number. Let’s say you roll a 2, 3 and 6. You can put one worker on advisor two (the squire, who gives you one gold), one on advisor three (the architect, who gives you one wood) and one on advisor six (the alchemist, who generates two resources from one.) You can also combine dice, so you can put all three on advisor 11 (the swordsmith, who gives you choice of two different pairs of goods) if you want. Fudge chits allow you to add two to any die roll once per phase. The catch: if someone beats you to an advisor, you can’t place there, limiting your possible choices. Since turn order changes based on the dice rolls, with the lowest roll going first, so being last isn’t always a detriment, particularly if you’ve rolled very high. Sometimes, you just have a crappy roll, and end a phase with unallocated dice. However, you’re using your resources to build structures in your town, so if you build a market, you can place a die or dice on one location per phase where someone else may have already placed. Structures generate victory points as well as some advisors. 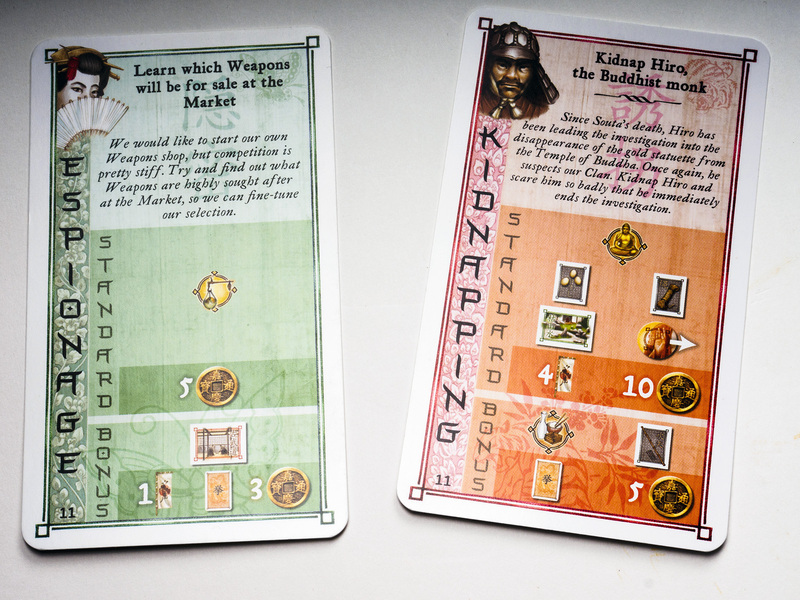 Kingsburg uses dice to represent workers; only exact combinations of your rolls may be placed on advisors numbers. 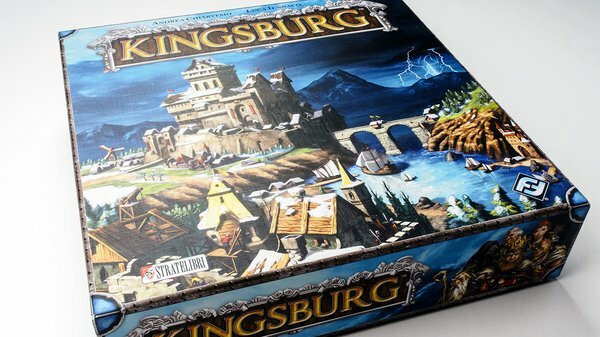 Kingsburg is played over five years, with each year broken up into four seasons. You collect resources and build during Spring, Summer and Fall. Winter, the barbarians come and you need to fight them off (each player fights her battle individually.) Win, and you get a reward, being defeated results in losing something. At the end of five years, you tally up your points. It’s mechanically pretty simple, but you need to be strategic about your choices of buildings. You can’t build everything, and probably want to focus on moving completely up a couple of the tracks. Four players who know the rules can play the game in an hour, but expect to take two in your first run-through. The base version of Lords of Waterdeep, without the Scoundrels of Skullport expansion, is an excellent first worker placement game. It’s deep enough to force a player to start thinking about how to build their engine, but simple enough to pick up the different systems quickly. The premise is simple: you play one of the secret lords of Waterdeep, a large town in the Dungeons and Dragons Forgotten Realms campaign setting. 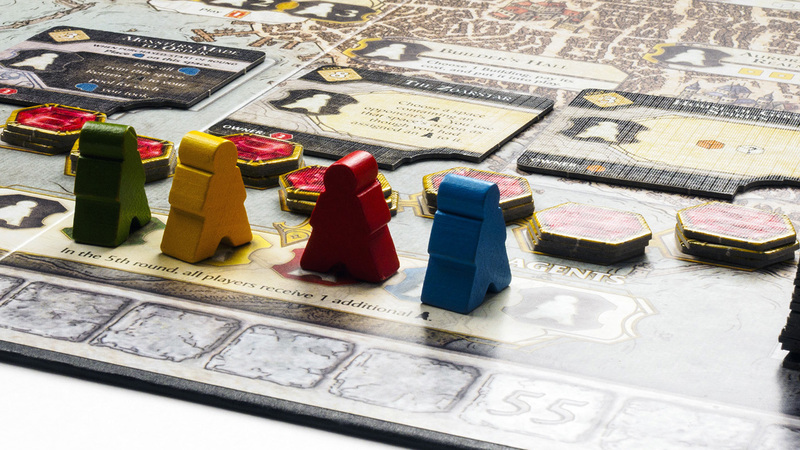 You need to know nothing about Dungeons and Dragons, however – Lords of Waterdeep is purely a board game. In fact, if you don’t know D&D, then the theme seems just a bit thin, but if you are a fan of the tabletop RPG, the game comes just a bit more alive. Each Lord has a hidden goal, usually accelerating the acquisition of victory points. A typical goal is to complete a type of quest; another one is to own the most buildings. You play one of these fine, upstanding civic leaders. You hire adventuring parties to complete quests (adventurers are just a resource to be used.) Each completed adventure generates, points, resources or long-term advantages. Some player interaction, though the use of intrigue cards, can occur, but it’s fairly limited. However, playing a low-VP mandatory quest on another player at the right time can substantially slow down someone in the lead. The key to winning is to keep completing quests (unless you have an alternate goal); you can only play one quest during your action phase, so you’re typically overlapping resource gathering for multiple quests as you place your workers. Your workers – and hence, actions, are limited. Building structures is a tool to helping gather resources (adventurers or gold) in order to complete quests. After eight complete turns, the game is over, and you count up your VPs. 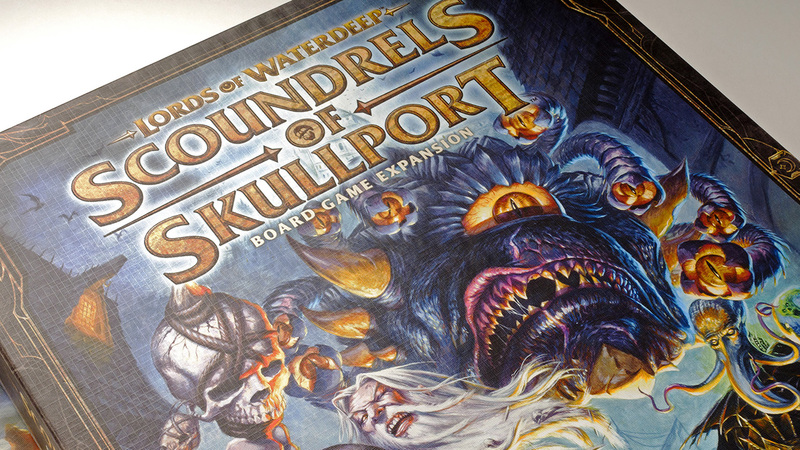 Scoundrels of Skullport adds a layer of complexity and strategic depth, particularly if you use the Skullport module, which introduces corruption as a two-edged resource. This is one of the best expansions I’ve seen for any game, enriching the theme and adding strategic depth with only a modest increase in complexity. Lords of Waterdeep plus Scoundrels of Skullport, in their full glory. Lords of Waterdeep plus the expansion almost always comes out in my bimonthly board game meetup. Even if I’m not playing it, some group wants to take it out for a spin. It’s fun, fast and offers multiple paths to victory. It’s reputation is well-deserved, and if you want only a single worker placement game in your collection, this wouldn’t be a bad choice. The conceit here is that you’re an entrepreneur in the great age of Steampunk Victoriana. 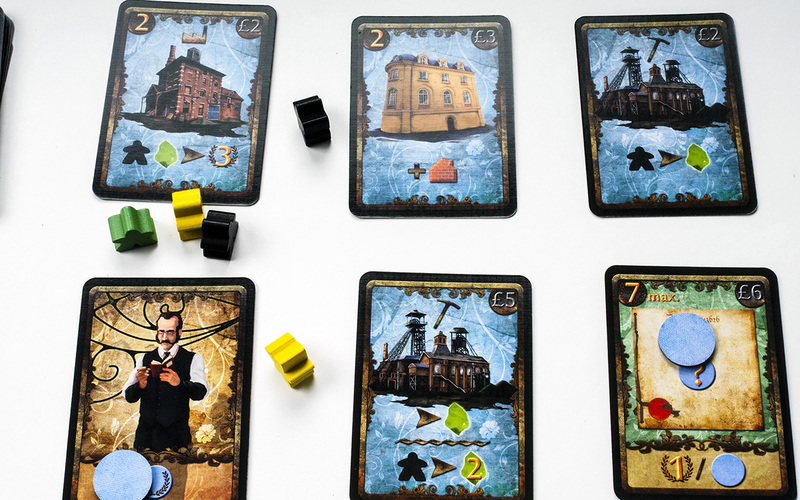 You’re building factories in order to mine the magical unobtanium of the day, Spyrium. In truth, Spyrium is just a one resource to assist in gathering victory points, but the theme works reasonably well. The artwork serves the theme well, and the way the card effects stack also seems thematically consistent. 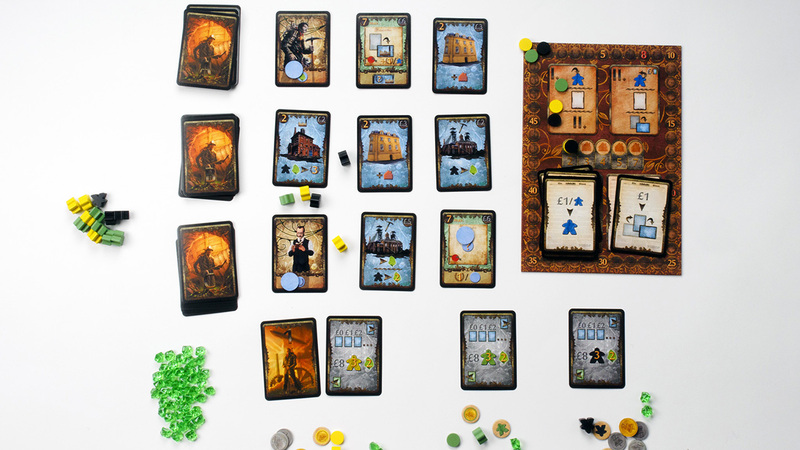 Spyrium is a slightly different take on worker placement. The board is mostly to track status; the real action happens on the grid of cards. Cards are stacked in stages, prosaically labeled A, B and C. You exhaust each stage before laying out other cards. As players claim cards, another one replaces it from the appropriate stack. The action in Spyrium takes place on the grid of cards, not on a board. 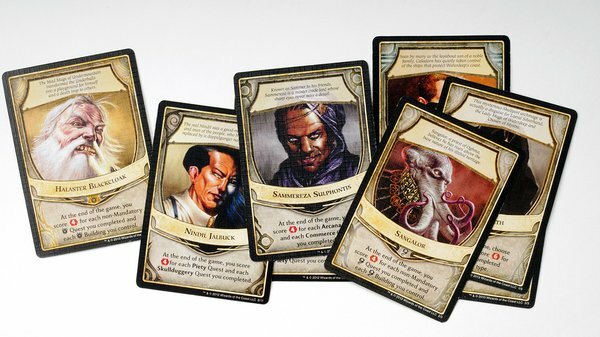 Character cards yield a one-time benefit, and are discarded the round. 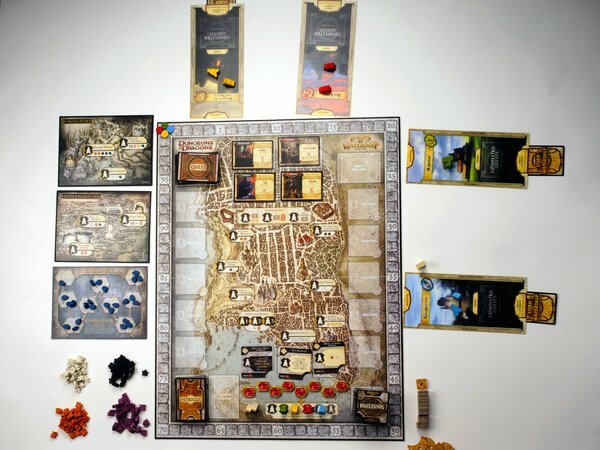 Players acquires Buildings and Techniques. Each building takes up a space, and the cost of spaces increases for each building, which limits how many buildings you can practically build. (You don’t pay a space cost for building over an existing building.) Buildings and Techniques typically give you lasting or reusable effects. You place workers between cards you want to claim; additional workers increase the cost of the cards. The catch: if another player places a worker in the same location as yours, the cost of the two cards increases. Highly desirable cards go up in value; think of it as a kind of virtual auction. It’s also a useful counter – maybe you don’t need a particular card, but you know your opponent needs it for her strategy, so you place a worker to drive up the cost. It’s a level of interaction many worker placement games lack. Spyrium is not without flaws. The third set of cards offer odd inconsistencies, like long-term benefits that are useless in the endgame. The rules aren’t well written, with some ambiguous entries and confusing wording. Still, Spyrium is a relatively compact, short game that offers some strategic depth in its player interaction, but doesn’t overstay its welcome. 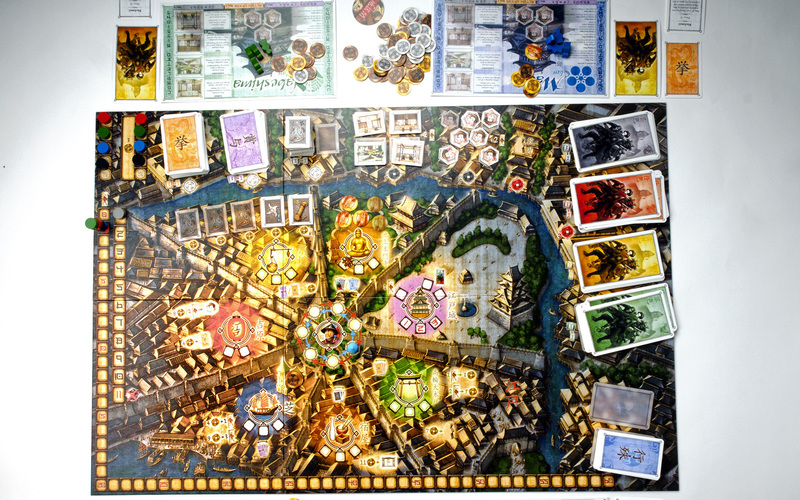 Yedo scratches the same itch as Lords of Waterdeep, but with tougher choices and a more richly laid on theme. 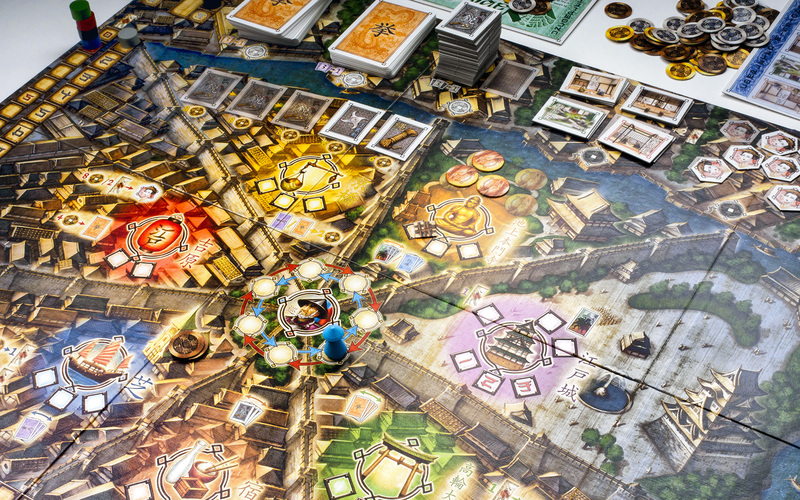 Similar to Lords of Waterdeep, you play a clan leader in feudal Japan, circa the early 17th century. Each player vies for the favor of the Shogun. The winner is the leader with the greatest favor at the end, or even the one – if you dare dream it – who replaces the Shogun. You perform missions for the Shogun, but the missions are thematic, and are sometimes multilayered. Yedo splits the missions into four categories, green, yellow, red and black, in order of difficulty. Each mission also has two levels of rewards, allowing you to choose the standard reward for some quick resources, or wait until you can fulfill the bonus award to gain more. Two levels of rewards and entertaining flavor text make Yedo’s missions seem a bit more thematic. Before you can attempt a red or black mission, you’ll need to assign your loyal agents to key locations to gather rumors, resources and weapons. Do you worship at the temple to gain Buddha’s blessing, or visit the red light district to recruit a geisha to enrich your reputation? The choices are difficult, and other players will often try to block you. Plus, the wandering watch patrol may foul up your plans with their meddling. You are a clan leader trying to win the favor of the Shogun. You can take the high road or the low one, but either can lead to victory or defeat. 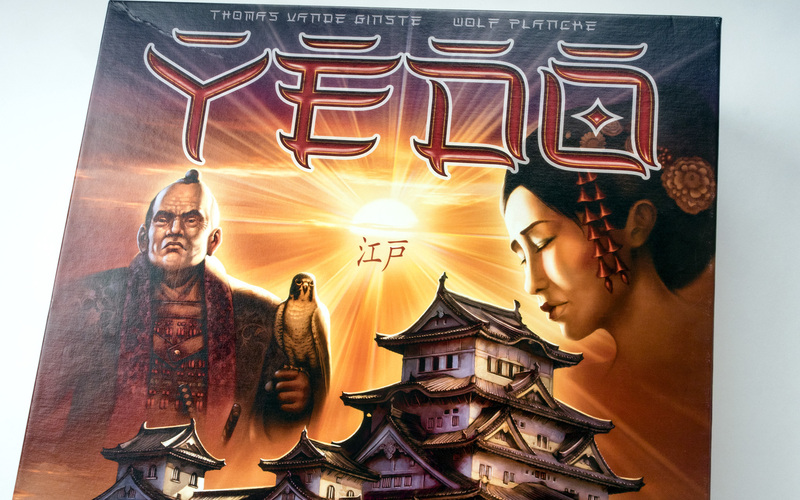 Yedo offers two difficulty settings, “Geisha” and “Samurai.” The game isn’t any simpler in Geisha mode; Samurai mode adds action cards that can screw with one or more players, and sometimes it feels arbitrary and random. So Geisha mode is for more genteel players, while Samurai mode is for those players who like their game playing more risky and unpredictable. As with most worker placement games, you have multiple paths to victory, so if another player consistently blocks you, try something different. The mission cards may affect your overall strategy, as do the choices of available weapons and what annexes you choose to build. Annexes grant special abilities and aren’t affected by the watch patrol, who can arrest hapless agents caught in the wrong location. Yedo’s main flaw is its busy board. While the artwork is gorgeous, tokens and gold can sometimes get lost in the busy artwork. So make sure to scan all the district carefully to make sure you haven’t overlooked something. However, Yedo is thematic, tight and entertaining, so it’s well worth a look if you want a flavor of feudal Japan with some strategy mixed in. You begin with a base set of construction workers, which you use to gather resources or recruit better workers. Resources are used to acquire buildings to generate more resources, with the ultimate goal of collecting yellowcake uranium. Yellowcake is used to either build relatively low bombs or sent to refineries to generate enriched uranium for higher yield bombs. Lots of things to do, but it really boils down to the bomb building. There are a lot of wheels in motion in this game, but some of them are just distractions. Attacking other players directly with bombers, for example, really doesn’t slow them down much, and costs too much to use effectively. Espionage is more useful, allowing you to use your workers on enemy buildings. One good point about the game is that it’s possible to win even if you seem to be far behind, provided you stay focused. I’ve won with relatively few resources by focusing on building a couple of high-yield bombs. And while bomb testing allows you to build even bigger bombs, it’s also often a distraction. 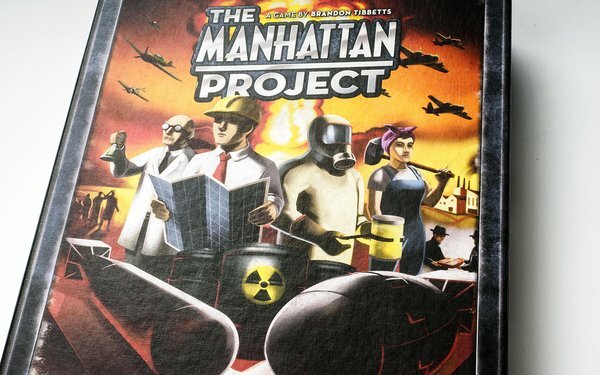 Still, The Manhattan Project’s theme works well, and enhanced by the whimsical period art. The rulebook is complete, if a little disorganized, but the writing is slightly tongue-in-cheek. This is not a serious commentary on the moral implications of nuclear weapons by any means. Playable in an hour if you know the rules, it’s an entertaining game – not perfect, but just the right thing if your group is in a darkly humorous mood. Euphoria is a slick-looking worker placement game offering multiple paths to victory. The glossy, cheery artwork provides a sheen over a rather dark theme: you are vying to become the master of a dystopian realm, and you can only do it by keeping your workers dumb and happy. My version of the game is the Kickstarter deluxe version, with some extra cool bits. The resource bits are fully three-dimensional, and some (gold, clay) have some serious heft to them. The board itself is double-sided, one cheery and colorful, the other gray and dismal. I personally prefer playing on the monochromatic side; it’s easier to see what’s going on and has the bonus of feeling, well, more dystopian. It’s all about keeping your workers dumb, happy and productive. Unlike most worker placement games, Euphoria lacks a victory point track. Instead, players each have ten stars, and the first player to place those stars in appropriate locations wins. Workers are represented by dice; you begin with two dice, and can acquire up to four. Beware, though, the Knowledge track. If your cumulative die roll exceeds a certain (variable) number, your workers wise up and leave your little dystopian world. On the other hand, if you move up the happiness track, you can collect more artifacts, which are important to advancing your cause. You place one worker per turn, but if you roll doubles, you can place the two identical workers in the same turn. Dice are your workers, and the resource bits in the Kickstarter version are superb. At first blush, Euphoria has a lot of wheels spinning at the same time, but it all boils down to collecting a base resource, using that base to acquire advanced resources, which you then use to build market buildings. The twist is that the buildings have a group effect – those who shared in the construction gain any benefits (typically ways to place stars), and negative effects hurt those who didn’t help. It’s almost impossible to build a structure by yourself; what typically happens is that a player starts building a market by placing a resource, then others rush in to help out. Three of the factions behave similarly, while the fourth – the sky-based Icarites – generate Bliss. While each placement in the Icarite area is slightly more powerful, they have no advanced effects, which the other factions acquire once they fully dig out their tunnels. 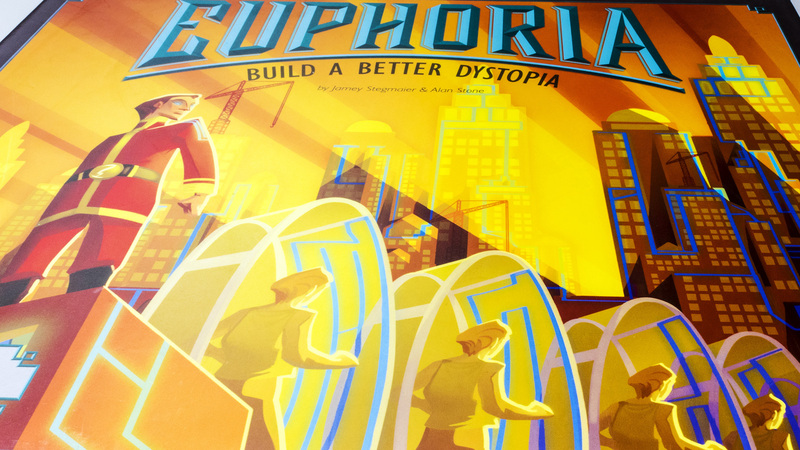 Euphoria is a shiny, entertaining game, if a little confusing at first play. The key is to acquire the resources to participate in market building, though it is possible to win by focusing on the Icarite section of the board – but only if you have the right recruits. You get one face-up recruit at the start of the game, and another later, and each recruit yields a unique ability. Some are quite powerful, others more indirect. Your recruits often shape your overall strategy, and the mix of recruits among the players make for less or more interesting gameplay. It’s much less fun if everyone has recruits from the same faction, for example. Euphoria represents the overall evolution of pure worker placement games, with a focus on getting your resource engine up and running. Perhaps the one key flaw in Euphoria is the doubles rule. If a player has a hot streak of doubles rolling, they can often run away with the game. That doesn’t seem to happen too often, and may be offset by other players working carefully to shut the hot-rolling player out of building markets. 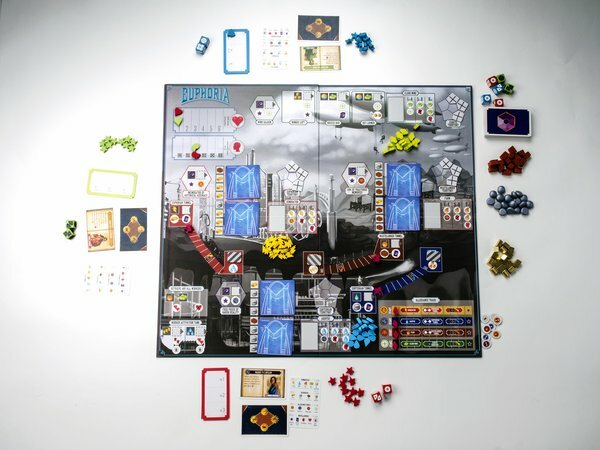 In the end, Euphoria represents the overall evolution of pure worker placement games, with a focus on getting your resource engine up and running. It’s slightly wonky, a bit clunky, but charming in its unabashed use of the dystopian theme. The text on cards and building is funny and thematic and the quality of the components always elicits raised eyebrows. Euphoria is unlikely to be a classic of the genre, but it’s a good representation of where worker placement games are going. While worker placement is popular, it also has a very specific appeal. Even games with high levels of interaction reward building your economic engine more than screwing with other players. Worker placement games are great if you like thinking through strategies while trying to optimize your economic engine. 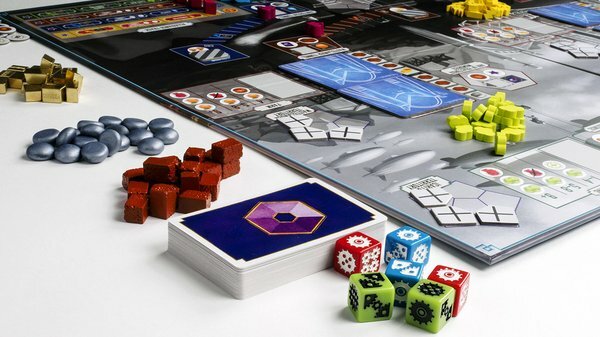 If you really want meaty player interaction, you might want to look to other genres, like area control or area majority games, which offers in-your-face competition in spades in spades. But that’s a topic for another time!